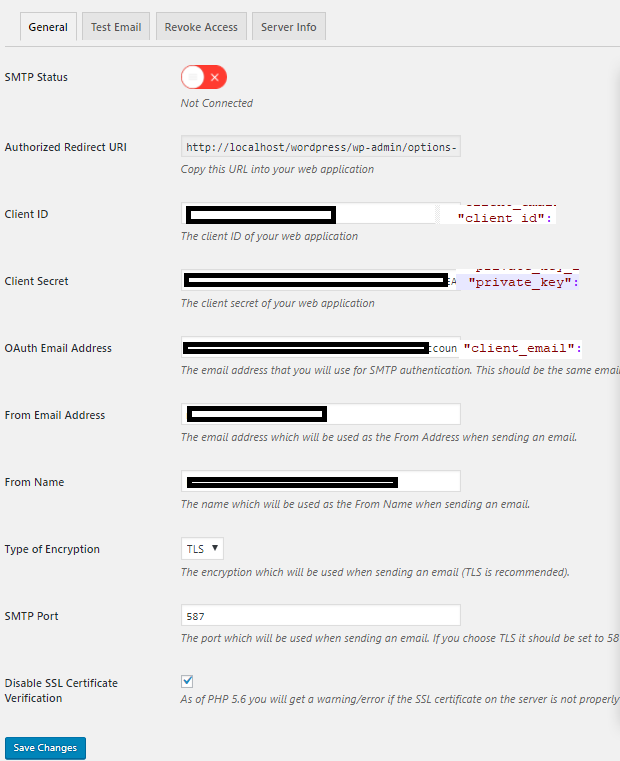 I am trying to add Google SMTP plugin to my wordpress website. I have installed plugin, then went to Google Developer Console created new project, added Gmail API, added Credentials. Now this step came out different to how I remember it used to be. Instead of getting API key I got a JSON file that has all the info, still fields seem to match mostly. So I clicked the link and added http://localhost/wordpress/wp-admin/options-general.php?page=gmail-smtp-settings&action=oauth_grant in google developer console, OAuth Conscent Screen tab Homepage URL (Optional) field and saved it but error remains my guess is ether I am not putting url into correct place or because I am running app from localhost. Where do I need to set up redirect url for this error to go away? JSON file indeed was the issue I went back to Google Developer Console and choose to create Credentials again it then gave me an option of OAuth client Id and later an option to add origin and redirect urls which sorted the issue. Not the answer you're looking for? Browse other questions tagged plugins email google smtp or ask your own question.